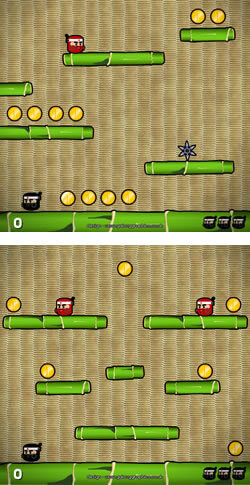 Platform Ninja, a rebrandable platform game by Galaxy Graphics. The platform game is a staple of the arcade genre and unlike many other games, non-violent. This makes it particularly useful for certain clients and marketing promotions where destruction is undesirable but a fun, simple and addictive game is perfect. Simply use the cursor keys and space to run and jump your way around the screen, collecting objects (in this case coins) and avoiding the enemies. If you are interested in licensing this platform game for your own site, or a custom rebranded variant of it, please contact us for more information. Looking for Platform Ninja's source code / Actionscript 3.0 / .fla file ? The source code for this game is also available to buy from Galaxy Graphics. As with all other games, the source code for this game is fully documented allowing any developer to easily pick up and modify the way things work, and with a logically organised symbol library, allows any designer to pick up and modify the way things look. Click here to contact us about Platform Ninja source code.